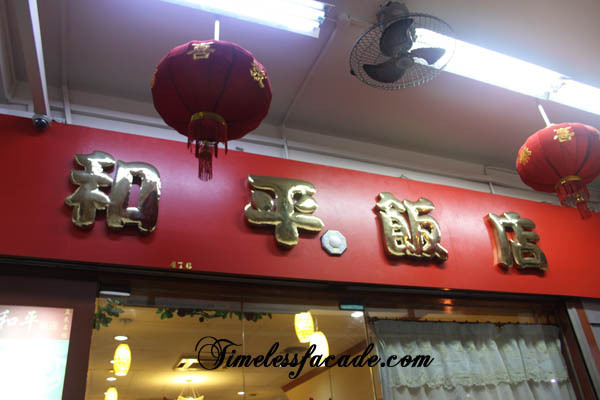 After the shocking mother's day lunch at Si Chuan Dou Hua the previous year, it was decided to head somewhere more low key and down to earth this year. May I just make it known that I still think occasions like mothers day/fathers day etc are just ploys by unscrupulous merchants to jack up their prices and serve you substandard food. 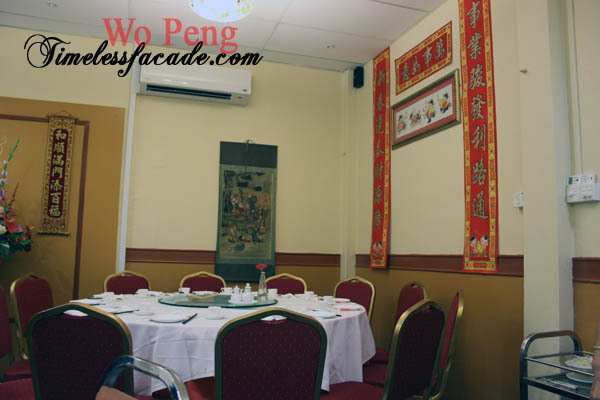 But here we were, at Wo Peng, for a mother's day dinner. Apparently the chef, Hong Kong born Julian Tam, used to preside over the kitchen at Furama Palace at Furama Hotel and left to work in Guangzhou for a couple of months before returning to Singapore to open up his own restaurant. The place is easy to miss, occupying just 2 units along Macpherson Road, where parking is a nightmare. The restaurant itself isn't big, probably squeezing in 50 pax or so and everything is kept no frills, from the tables and chairs to the ornaments that decorate the walls. Shark's Fin Soup - If you are a fan of adding vinegar with your shark's fin soup, the staff at Wo Peng will advise you not to because according to them, the soup is naturally flavoured by herbs and don't require any addition of vinegar. I must conceed that they are absolutely right. The soup had cordyceps, ginseng and other unidentifiable (by me) herbs that made it light yet tasty with a mild herbal connotation. The fins weren't exactly of superior quality but acceptable nonetheless. 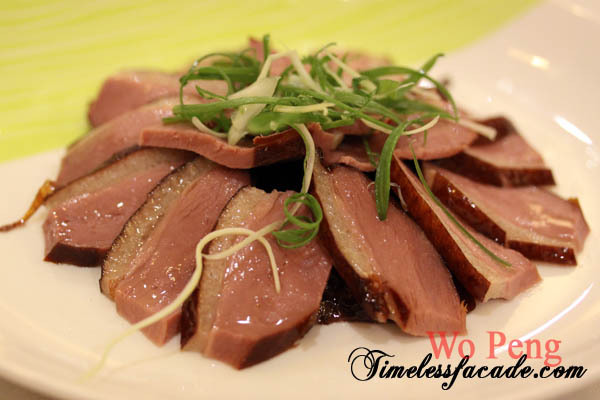 Smoked Duck - I simply love this dish. It has got to be one of the best duck dishes I've eaten since the start of 2009. The skin was crisp while the meat was smoked to a reddish hue and came across as very smooth and tender. There wasn't an overly generous salt content as well and tasted a little like ham. Nice! Stir Fried Red Garoupa with Sweet Pea - This dish was rather normal though the fish was rather fresh and served up with dried mustard greens (梅菜), which gave it a salty tinge. I did like the sweet peas though, which were sweet (duh! ), crunchy and not overly cooked. Steamed Garoupa - This was actually a continuation of the the first fish dish, where the fish head was chopped up and steamed with pork slices, black fungus and red dates. Personally I preferred to the former as the whole dish was actually more savoury. But being only fish head, the meat was limited. Peng Cai - This dish is usually sold and eaten only during the Chinese New Year period. 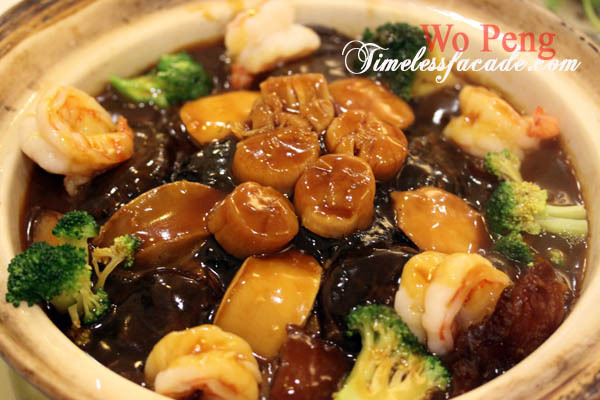 But here at Wo Peng, its available throughout the year but only with an advance order of course. There were the usual suspects - dried oyster, prawns, mushrooms, broccoli, goose web, scallops, dried abalone, sea cucumber and surprisingly, radish, which is said to be found only in authentic HK peng cais. Although I am no fan of peng cai, I thought that this one was quite well done as the whole thing was stewed long enough for the flavours to permeate through to the various ingredients. And may I add that portions were huge for 5 people. 6-7 would have been a more manageable number. Fried Noodles - The noodles were a thicker variant of mee suah and came across as soft but not too soggy. It was tasty and came loaded with lots of seafood but it got really nauseating after a while and I gave up after my 2nd bowl. This is the first time I'm feeling so overwhelmed by the amount of seafood thus far. 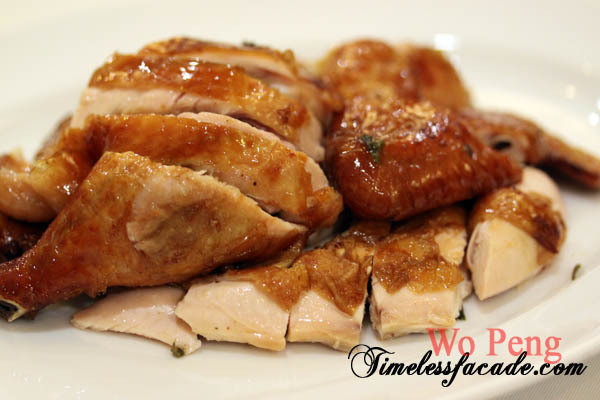 Roast Chicken - Finally a white meat dish and I thought that it was actually quite good. The meat was tender while retaining its flavours and moisture. The skin was a nice homogeneous golden brown but a pity it wasn't crisp. Hasma - Also known as the poor men's bird nest, the Hasma came with dried longans and dates and tasted like hot cheng ting. To be honest, I am absolutely terrified of this dessert as it is made from dried fallopian tubes of frogs and somehow, ingesting an organ that plays a pivotal role in reproduction doesn't exactly settle well with me. A satisfying, if not button bursting dinner cost the 5 of us to the tune of $350, which works out to be roughly $70 a head. Reasonable if you ask me, especially for the quality and quantity of food. Moreover, ingredients like shark's fin, abalone, sea cucumber etc don't come cheap. Service was great and even more commendable in the absence of any service charge.